Today's PC's requires newer technology for use with game devices. After my latest upgrade to my crate, I found my analogue controls would no longer work properly. There is no game port available that can keep up with a quick CPU, so the only solution is digital control. For digital control, I switched to an MS Precision Pro FF stick. This controller is precise, but has its drawbacks. My main beef is with the twist yaw control, which has difficult response and is unnatural in operation. Also, I really dig pedals. These specs say 'go for it'! Who am I to argue? Hofmann has two types of pedals available, the SIMPED-Digital and SIMPED-Vario. The Simped-Digital is for digital controllers only and includes the interface. I opted for the Simped-Vario and the Sim-FFB interface. This setup is perfect for use with my MS FFB stick while leaving me the option of using them with other controller types. My pedals and converter were shipped by regular mail, which seems to take an excruciatingly long … time. Still, all things come to those who wait and after ten business days I was rewarded. Opening the box revealed complete package of some of the best fabrications I've ever seen and clear concise manuals for the two devices. Also included is a brochure, which in bold red lettering exclaims, "You are enthusiastic!" Why yes, I am! 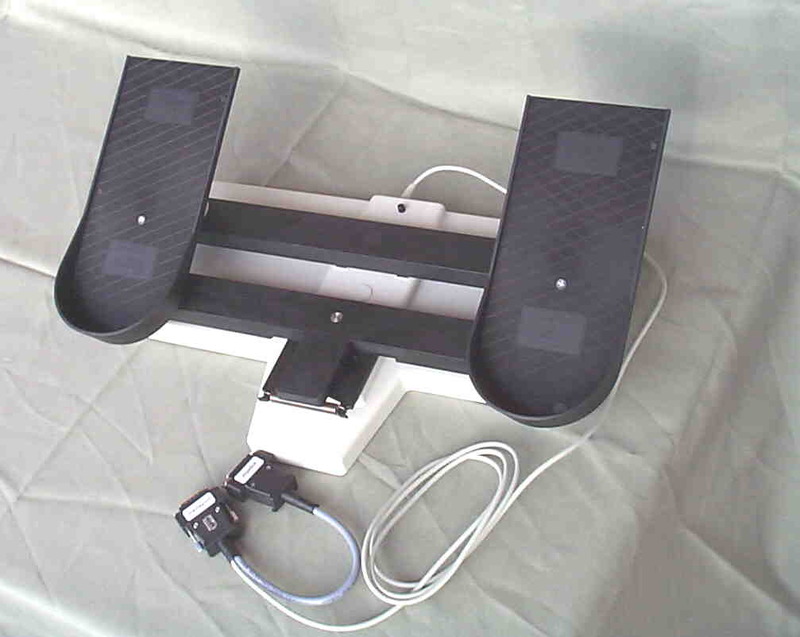 The case bottom of the pedals is high-density plastic, while case upper is fiber reinforced high-density plastic. The control arms, foot rests and centering mechanism are graphite reinforced high-density plastic. Moldings and machining are accurate. The centering mechanism is external and has a single spring action that can be adjusted for tension. The sensor magnet is imbedded in the forward control arm and fits so well it is nearly invisible. They are precisely fabricated and robust. 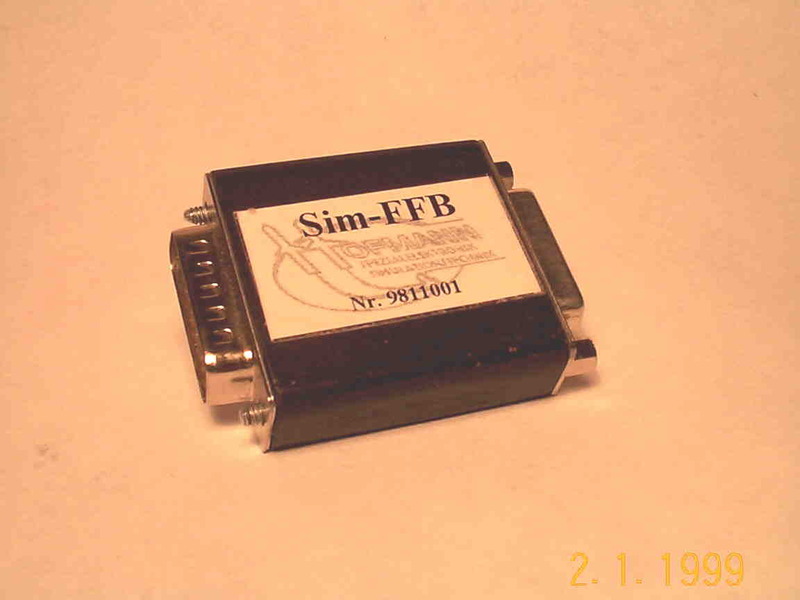 The Sim-FFB is a tiny coprocessor that connects in line with the pedals' y-adapter. It disables the rudder function of the MS FFB and enables the SIMPED-Vario with a quadratic control curve. This curve is optimized for use as a rudder controller. Also included are hook and loop pads for 'sticking' the pedals to a smooth surface. I found these unnecessary on a carpeted floor. The game port connector for the SIMPED-Vario has four dip switches. Turning number four on enables the pedals to function with the Sim-FFB. After installing the foot pedals with the #2 Phillips screws, I hooked it up and turned on my crate to check calibration. Everything works fine, time to open it up. The lower bearing cap pops off and unscrewing the four #1 Phillips screws in the bottom plate enables its removal. This reveals why these pedals weigh exactly 2500g; part of the case is filled with putty to add weight for stability. Opening the small forward compartment entails the removal of four #0 Phillips screws. This contains the Hall effect sensor circuit. Overall, the dissection shows fine engineering and exceptional execution of technology. In MS Combat Flight Simulator I found the yaw control greatly improved. Unintentional high-speed snap rolls became a thing of the past; targeting improved and ground handling became much easier. I used them while testing the Allegiance Beta as well. This is a space ship game and space ships don't generally have rudders ;-) Still, I found the smooth response of the Hofmann pedals to be a great asset. Collecting artifacts and life pods at full velocity became much easier. The response of the pedals is superior to the other joystick axes, so I found myself using the yaw axis as much as possible. In a Heavy Interceptor using side thrust to evade fire, while aiming with the pedals was quite effective. My main game is RB3D (Sierra/Dynamix Red Baron 3D), so this is where I enjoy the response improvement the most. It's much easier to take an AFM (Advanced Flight Mode) Camel right to the edge in a hard left-hand turn, without the inevitable snap, spin and crash. Turn coordination is far easier, so loss of altitude in a wild evasive maneuver becomes minimized. This is essential flying NFM (Normal Flight Mode). Targeting has become so natural in the yaw axis, it makes the roll and pitch responses of my stick seem bad!